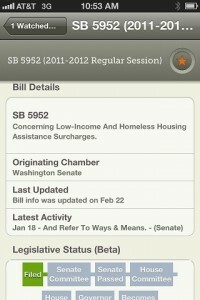 The Open States legislative database just released their legislative info in the form of a free iPhone app! You can read their announcement HERE. I downloaded it right away and want to share some of the great features with you. It should be noted that the Washington state data is still in beta form so things aren’t quite fully updated to real time. But it is still awesome and I’m sure they will finalize things soon. 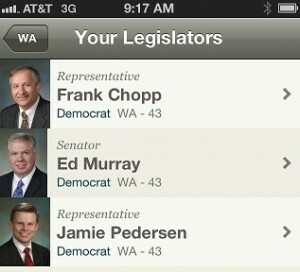 The app uses geomapping to identify your location and match the legislators to the location. Now I don’t live downtown, so these wouldn’t be the legislators I normally contact. 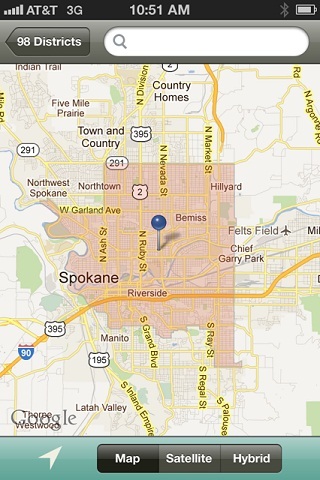 I do work downtown which is when I used the app! So when using the app to locate your legislators, you do need to be mindful that it is going to go by your current location, even if that isn’t where you are registered to vote. You can also look up a district on a map. I looked up this district by clicking on Sen. Lisa Brown, the Senate Majority Leader. I personally really like visuals and so really enjoy matching a specific legislator and district number with the mapped district–actual shape and all! 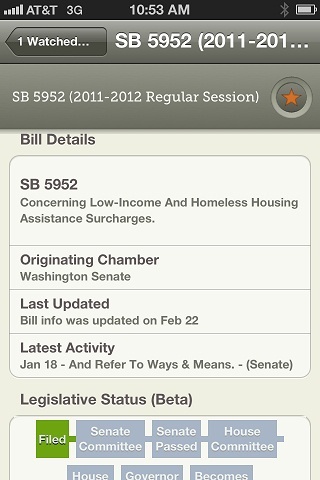 I looked up one of our endorsed bills, SB 5952, and thought it was so cool to be able to track it by starring it. It now shows up on a watch list and provides updates. This is the area that most reveals to me that they are still in beta phase–it is not very current. The last update was made on Feb. 22nd and the bill has made a lot of progress since then–including passing both the House and Senate! But I can see this being really great in the future once it is in final version. It is a fantastic summary of the bill, regardless of outdated updates, including all sponsors, actions, and subjects covered. 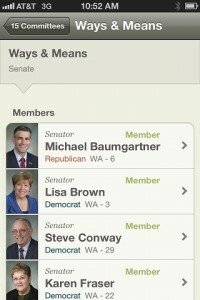 It does link through to the official WA legislature history of the bill page, which has all current action taken on the bill. Have I already said how awesome this is? Bills are often referred to various committees and many legislative action alerts ask you to reach out to committee members who will vote on the bill. So this feature is pretty great since you can search the different committees and it gives you a legislator summary. But wait, it continues to get better. It includes each legislators email so that you can send an email right from your phone. 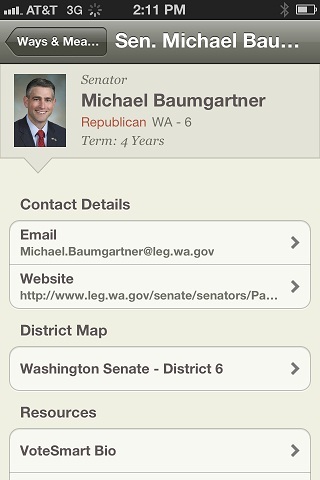 I clicked on the very first senator on the list, which took me to his summary page. I then clicked on his email address which took me directly to my Gmail! The likelihood of me actually sending an email to a legislator has just exponentially increased, especially since I really can do it anywhere now. I hope this is the case for others too! Recognizing this is still a work in process, I give Open State 5 stars. In fact, I even went to the effort to be one of the first people to rate the app in the app store! If you’re an iPhone user, definitely give it a try and look for Open States.